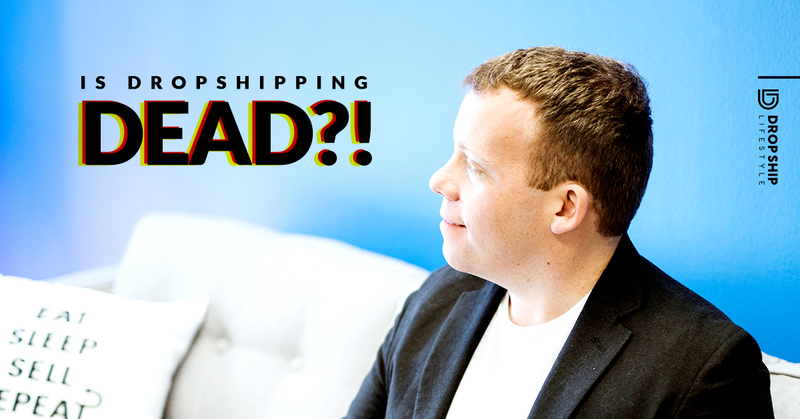 →Is Dropshipping DEAD?! Will Dropshipping Survive Past 2019? People have been asking me this question since 2012, when I was first starting to talk about my success with dropshipping. And It’s always been a good question. With the speed at which technology changes and advances, it’s important to keep up with the models and trends. In this blog post, we are going to go through common misconceptions about whether dropshipping is worth it these days. I’ll give you the real answers and show you exactly how alive and well dropshipping still is. “Is dropshipping dead?” was a popular question back when I first started, and it’s still a popular question more than a decade later. So let’s get into it. Before I created this blog, I wrote down a list of more specific questions our support staff and team hear most frequently about whether dropshipping is dead. "Isn’t There Too Much Competition? It Seems Like Every Niche is Saturated...​"
"Won’t the Trade War with China put Dropshippers Out of Business?" "How Can You Dropship Profitably with the Increased Costs of Advertising on Facebook and Google?​"
​"But I Heard ______ Doesn't Like Dropshipping?" So, the first thing that people ask about ​when they ask, "Is dropshipping dead?" is competition. ​And competition leads to saturation. Dropshipping is not new. I've been doing it, myself, since way back in 2008. And people have been doing it longer than me. Short answer is: No, that's not true. When you're using this model when you're dropshipping, your goal should always be to work with new suppliers and new brands and always ​sell the newest and best products that come out. ​​A bit of competition isn't bad. In fact, you will​ want some in your niche. If nobody is selling what you want to sell, that's ​could be a huge red flag. Well, the industries that we sell in, they are still getting sales, they are still selling strong. But the top brands, the top SKUs, the top products, they are now in their​ 12th year. Products get updated. New brands come out. Brands release new product lines. So a big part of ​the answer to this question, is to always be that person that's out on the front of your industry. And I'm not saying to only sell trending product​s... But if you're in the office furniture space, then make sure every year you're working with the best brands that make office furniture. Make sure you're getting all of their new SKU numbers on your website. Make sure you're promoting them. ​Then all that competition you're thinking about. All those people that have been doing it for so long, guess what? Some of them are lazy, some of them don't update their sites. Some of them are comfortable making what they're making with stuff they haven't updated in the past ​five or so years! So as long as you're willing to do the work and stay on top of your business, which I hope you would be, if you're really planning on doing this. Then, no, it's not too saturated. ​​There are literally new opportunities popping up every single day when it comes to products and suppliers. ​There will always be new opportunity there. Do not worry about ​dropshipping being too competitive, because it's really not. Next question that we get that comes in with "Is dropshipping dead? ", is "I heard Trump is having all these tariffs and we're in a trade war with China and everything is going to be more expensive. Is ​dropshipping worth starting?" Couple things on that. First, we do not dropship from China​. If I was directly in that business, would I be worried right now​. If I was dropshipping from China, I would definitely be looking a lot closer at it than I'm looking at what we do. What we do, and what I recommend you do, is work with domestic brands. So, for me, that means suppliers in the States. If you're watching this from Australia, that means suppliers in Australia. If you're in the U.K., That means suppliers in the U.K.
Now, with this whole tax and tariff thing, even if products that come from China to our suppliers here in the States get more expensive​ because that​might happen. ​Then suppliers might raise our product costs. But guess what? Then the product cost to the customer goes up and everything kind of works itself out. I'm not worried about it. You shouldn't be, either. Especially not if you're no the Drop Ship Lifestyle model. ​So, again, with ​domestic suppliers, I wouldn't worry about it. If you are relying on dropshipping from China, maybe re-evaluate your business, anyway. Okay, next question about "is Dropshipping dead?" is about the growing costs of paid traffic and ads– specifically with Facebook and Google. If you ​want to say that things are expensive now because 10 years ago they were dirt cheap. Well, guess what? Ten years from now people are going to say, "In 2019 things were so cheap." Yes, ad costs go up. Yes, as more competition goes to different platforms, bids get higher and higher and higher. Does that mean there's not a market? Absolutely not. What it does mean is that you can't just be someone who's trying to game the system. Someone that doesn't want to learn anything. Someone that believes that they can click a few buttons, and Google and get rich. Maybe if you were one of the first advertisers on Google, that was a real thing. ​That mindset, that business, has been gone a long time. Now, if you're a real business owner, you get into this because you actually want to build something of value, that serves your customers and you. Then guess what? Ad costs are still ridiculously under-priced. Yes, on Google. Yes, on Facebook. Of course, you have to run them the right way. ​Dropshipping is​ not dead because traffic costs are up. Again, just wait ten years. People are going to say, You had so much opportunity back in 2019. I can't believe you didn't do, you know, everything. Start a business and build it. Don't look back with regret. Do this now and look back and be like wow that was an amazing ride. Next one is with people saying, "Is ​dropshipping dead? Isn't every niche taken?" I hit on this briefly before​, but you want to be involved a niche that other people are in. If you have some idea for a product that nobody is selling, that's a not a good thing. ​This was true even back when I started​ dropshipping in early 2006. I did not want to be the first one to ever try to sell something online. That's not how this business model works. So that's a ​great thing if other people are selling the product types that you want to sell! Now, that kind of leads into the next thing ​we are asked sometimes– "Why would a supplier want to work with me? I'm brand new and there's established websites that have already been doing this for so long." If you're trying to build something real, then the good suppliers are more than willing to work with you. They want partnerships like the ones they have with me, and my students, and you​– if you follow a proven system. And, again, if you focus on building a real business. ​The bottom line is if you have integrity and you're building a business for the right reason, you will be rewarded– in many different ways. "Google Ads ​Doesn’t ​Like dropshipping." You're not wrong. In fact, it's in their terms of service that they don't like dropshipping, and guess what? It's been there for more than ten years. I have never had a problem with Google Ads accounts for that. Neither have any of my students that use this system. What they don't like is the model of trying to get into arbitrage deals like buy something on eBay and sell it on Amazon. And dropship from Amazon and sell it on Etsy and all that stuff. They don't like that because it's not a real business. ​So is that type of dropshipping dead because Google doesn't like them to advertise with ​those businesses? I wouldn't say it's dead, but it's not a real business. ​It never was. ​That way was just a little​ hack ​to get some easy money. But, no, don't do that. ​That model is not what we do here. "​Stripe Closed My Account Because They Don't Like Dropshippers"
Another one, Stripe​ gets the same issue. You might see in different Facebook groups you're part of, "Hey I'm dropshipping and Strip closed my account for no reason." And I hate to ​break it to those people, but they didn't close ​their account because they're dropshipping, We've had Stripe since 2012. So have tons of our students. The reason Stripe closes accounts is because there's too much risk. ​They see that there's risk when there's a ton of refunds and a ton of charge backs. ​You know what type of dropshipping stores get a ton of refunds and a ton of charge backs? Ones that don't care about their customers. Ones that take three weeks to ship items. Ones that don't answer support tickets. On the other hand, the model of having a real business that provides real value to your customers isn't dead. ​In doing that, not only will you thrive on all of these platforms​, but you'll be rewarded in terms of customers coming back to you, sending more people your way, and seeing your business grow. "​How Come Amazon ​doesn’t ​Like ​Dropshipping?" ​Another thing that comes up is, ​"I heard Amazon doesn't allow dropshipping, is dropshipping dead?" Again, you don't want to be in the arbitrage model. You don't ​want to sell something on your site and have it shipped from Amazon. You don't want to sell something on Amazon then find somebody on eBay to fulfill the order. That's not a good way of doing business, whether it's dropshipping or not. So just don't do it, and it doesn't matter. That's always been dead. Now, one more thing that's somewhat related to that common "Is dropshipping dead?" question is about all these 'gurus' on YouTube. You've probably seen all these teenagers on YouTube making money from dropshipping and telling you to join their course to make money as well. You might think, "​If they're all making all this money, why are they selling courses on it?" Yeah, listen, I have problem with that, too. Again, I do believe that the model of dropshipping from China with three week lead times with bad support​ fas been dead for a very long time. And I also believe that a lot of these ​gurus you see popping up,​ are not actually​ doing well with their business. Surprise, surprise, right? ​That's my thought on that. It's not what I would recommend doing at any point in my eCommerce career over the past 12 years. I do think there​ are ways to do it right. But I think most people that you see out there, when you get flooded with a million people saying, "Hey buy my thing!!" I think, a lot of them don't have a thing besides that. ​The reason is because they're not trying to dropship the right way, They're trying to use a model ​where they were gaming the system by basically just trying to sell as much crap as possible, and not caring what customers thought about it. ​I never did that. ​And I never recommend doing that. If you stick with real, quality products from real, quality brands, ​and focus on your business, you're not ​going to have that issue. You're going to see a lot less people that actually do this the right way. But, hey, that's a good thing for you, right? If you actually care about building a business that provides real value to your customers, you will be successful in business. You will be rewarded in terms of profits, in terms of an asset, which is your business, in terms of people coming back to do more business with you. There's no end in sight for building legitimate businesses online with the drop ship business model. Building a business that provides real value customers will never die. ​Don't look for loopholes. Look for building something real, work with quality brands, care about your customers. Use those ingredients. ​If you do, you'll see that dropshipping is far from dead. Our businesses have only been growing since I first got into this more than a decade ago. ​And I would love to hear your comments on this topic as well, so let me know in the comments below​: Do you think ​dropshipping is dead? Why or why not? ​​And we can keep the conversation going. That is a good blog Anton, I took your course but never followed trough with it. At the time I had a Shopify site but wasn’t going anywhere with it, had it built with I believe, one of your so called gurus. Id like to have you look and comment on it. Would you mind telling me who built it for you? Not dead, just going to get bigger, why, more people are moving to online purchasing, retail is the one dying (Sears??). Agreed! It’s crazy how many storefronts are for rent. I spent the summer in NYC and some of the busiest areas had rows of vacant properties. Now is the time to get into eCommerce… as long as you’re in it for the right reasons!